I felt betrayed, hatred welled up in my soul. How could they do this to me, how could they destroy such longstanding traditions and disfranchises so many loyal players. I am referring to The murder of Warhammer Fantasy and the birth of Age of Sigmar. Pull up a chair I have a story to tell. I got into wargaming in 2008 at the age of 28. I was just been discharge from the Army and had moved to the Houston area. In the Army i was part of a small group of D&D roll players and I had been doing that for a few years. Now that I was out of the service and settled, I was on the lookout for a new roll play group. A few miles from my home in Pearland was a game store named Montags games. It was in the same shopping center as my dry cleaner and our family doctor. So when I would have other business in the strip I would pop into Montags and look around. I asked the owner about D&D groups that play in the store. He would always say that all the groups play at their house and they just buy the books at his store. I asked the owner Guy about any groups coming in looking for players, he said their was non at the moment. Most of the time when I made my way into the store there were people playing Warhammer or other mini-wargames. I was somewhat familiar with the Warhammer 40k universe from playing the PC games and seeing the models in comics shops. I liked the Futuristic models and idea of the game, but was at first drawn to the boxes of fantasy models. As I asked more questions about the Warhammer Fantasy I was Informed by the owner Guy and his staff-member Ryan Parker, “everyone refers to him as Parker”. 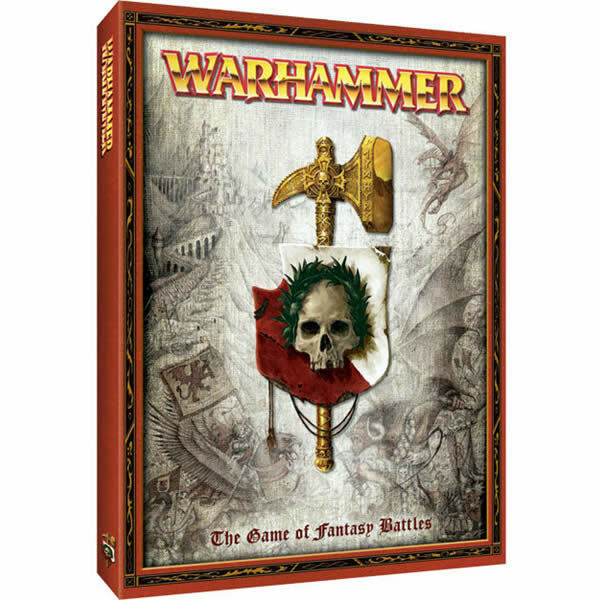 That Fantasy had a small player base, while many people had Fantasy armies 40k was the predominant game played in the store. Not wanting to buy into a game that I may have trouble finding people to play with, I opted to start my miniature gaming with 40k. Over the next few months I learned to play the game, paint the models and made new friendships. All the while I had my eye on Warhammer Fantasy. A little less than a year had passed and I had become friends with many of the 40k players, most of them had a Fantasy army. I felt confident that if i bought in there was enough people around to get in some games. I had to make a decision and pick and army. I had been eyeing the sturdy Dwarfs or undead Vampire Counts. To be honestly I cannot remember what army I first purchased. I remember selling the contents of Battle for Skull Pass at some point, but don’t think I ever purchased the box itself. All said I ended up focusing a Vampire Counts Army. I built hoards of skeletons and large blocks of Crypt Ghouls. I just like the idea of giant blocks of infantry moving across the battlefield. Over the next few years I played games with friends built and painted more models and even played in a tournament or two. Warhammer 40k was still the primary game played at Montags, but I made it a point to try and get a game of Fantasy as much as I could. Then things changed in 2013, Warhammer 40k 7th edition was released. When it released it was a bit of a surprise to us gamers, those were the dark ages of Games Workshops communications. It was unexpected because 6th edition had just came out 2 years before. I was in the middle of running a very involved 40k campaign, we had decided to play the last month or so of the campaign with the 6th edition rules because I was not sure how they would effect the campaign. After the campaign wrapped up I was excited to try out the new edition and many of the promised fixes that were included. After that I am not sure what happened, but I was burned out on 40k. I think it was part being worn down by the intensity of the 7 month long campaign I ran. Or it could have been people in general were upset with the 7th edition rule set and the way GW was treating its players. Or it could have been that other games like Warmachine were taking people interest. Many in the local group just sort of walked away from 40k. For me it was a time to get back into Warhammer Fantasy. The same sentiment was felt by a few of us, Star Wars Doug, Mike, Chaos Casey and me dived headlong into building and painting more models. We started a Facebook Messenger group and exchanged pictures of painting progress and kicked ideas off one another. This lasted for months. 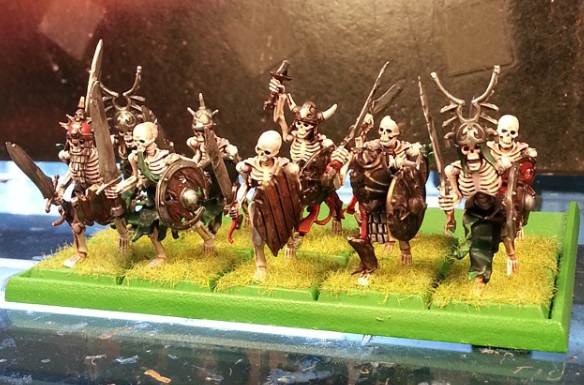 I can remember painting what seemed like 100s of skeletons. It was only about 50, but thats still a lot. I built a Terrorgheist from the new kit, and bought up lots of old Bretonnians to convert into Black Knights. Even with all its flaws I loved to play WFB 8th Edtion, our community was not all about power gaming and making OP combos. So people could have fun fluffy games if they wanted. 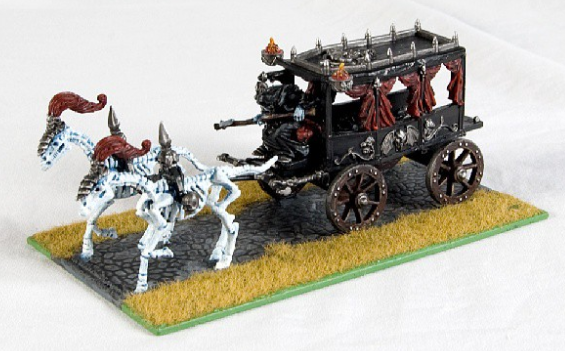 This was the peek of my love affair with Warhammer Fantasy. 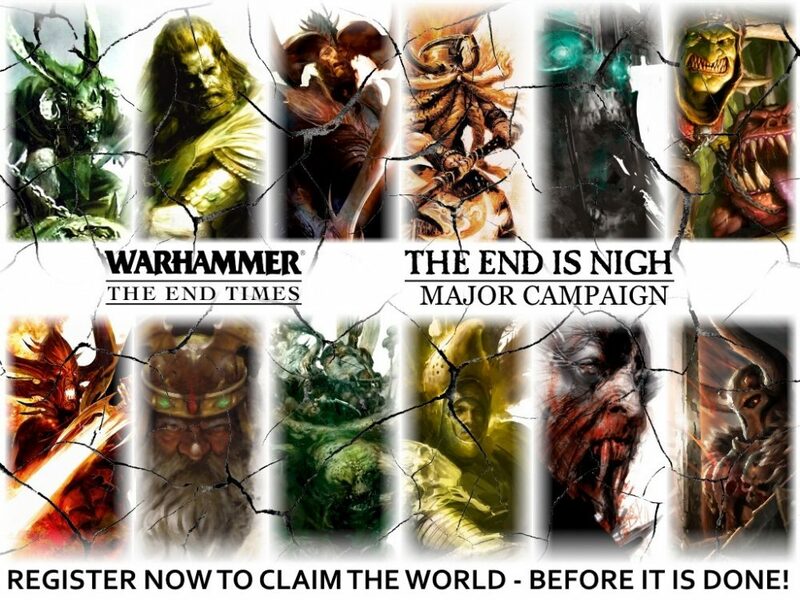 In September 2014, something extraordinary happened a new campaign book series was release for Warhammer Fantasy, it was named The End Times and at that point we had no idea that it would be just that, the end. As each of the books released it was amazing, new models were being made, the story of the world was being driven forward for the first time in a decade. These books were so hot that stores were only getting a limited number of copies and the secondary market they were selling well above MSRP. Guy was able to get most of the books for me, but I did have to look to Ebay for one set. I felt invigorated, we all had a feeling that 9th edition was about to drop and new that the local game group would be ready to gets some battles going. However this was not to be. At first it started as rumors that the new edition will be a total rework. Sites like http://natfka.blogspot.com/ were sending out word that the game we knew was about to change. All the leaks pointed to a drastic change. What did I believe? It was hard to tell, for a few years I checked the rumor mill often. It was the only way to get any idea on what was happening. Keep in mind this was still the GW social media dark ages. I was expecting a big change to the game, but I did not know how much. I was hopping they trimmed down the rules and cleaned up the OP magic, but left the game I loved intact. The one rumor that I did not believe was that the game was going to round bases and movement trays were done. This to me sounded crazy, that was such a fundamental part of the game I could not comprehend how you could do that. So I denied that was going to happen. The other rumor that I thought was false was that the Old World would be no more. I thought that the world may be changed, possibly shifting continents or something like that, but that Old World would still exist in some form. After it was all said and done my worst fears came true. The release of Age of Sigmar was a jolt throughout the Warhammer gaming world. The cries of pain and anger could be heard on every social media platform imaginable. I was in denial, this was a lie, it had to be a mistake. As I fully took in the width and breadth of the changes I felt betrayed. I had invested so much time and money into WFB and now it was gone. Not only gone but replaced by a hollow copy of what it once was. The rules were slashed to 2 pages, the new poster boy was a Space Marine imitation and many of the rules were written as a joke, “here is a rundown if you do not believe me: http://www.escapistmagazine.com/articles/view/features/galleryoftheday/14266-New-Warhammer-Fantasy-Most-Absurd-Ridiculous-Crazy-Rules “. People were losing their minds over the new game, people were swearing off GW, Burning their models, and calling for the heads of those that did this. I was one of those angry villagers with a pitchfork and torch ready to march on Nottingham. This was a dark time for me as a wargammer, 40k was in shamble, WFB was gone and I was adrift. I turned my attention to other games to try and fill the void. WarmaHords was picking up steam in the community so I primarily focused on that. X-Wing Miniatures was the hottest new game and I bought into that as well. I picked up Infinity, Dust, and Bolt Action to name a few more. My biggest FU to GW was that I purchased an entire Kings Of War Elf army and ran an escalation league for it. I will not go into my full opinions on Kings Of War here, but just to let you know it was not all positive. As I floated from game to game my passion of miniatures started to wane. I feel it was the same for many gamers. Not only did the local gaming community seem to be disenfranchised with it, but GW itself was loosing money from the mismanagement of their IP. Games like X-Wing had dethroned 40k as the most popular table top game. The outlook for everything Warhammer looked bad. Then in the darkness a flicker of light. I’m not sure if the change happened overnight or if it was gradual and I just did not pay attention. Games Workshop had started listening to its players. GW began informing the community of changes and to the amazement of all seemed to care what we thought. Because of the change in attitude me and few of the regulars, such as Vince and Ben were trying to build back the 40k player base, it had taken a major hit over the last few year. In 2017 Warhammer 40k 8th Edition was released and to my amazement I was excited. The promise of a new edition that fixed many of the problems of 7th was a breath of fresh air into the community. The total rework of army books and the Indexs were a great way to push the reset button. GW had learned from Age of Sigmar debacle and eased the game into a new age, instead of flipping the table. I know that 8th is not perfect and some players do not like the edition with the changes to templates and command point abuse. But even with all its flaws I was 100% back in the fold. So me and GW are back on good terms, it feels like a healthy relationship at this point. Our separation was short but well deserved. I think it gave both of us perspective. So what about Age of Sigmar? As time has gone on I have looked from afar and seen the changes they have made to AOS. At first I laugh with glee as they tried to fix the mess that AOS was. I had watched a few games a knew I wanted nothing to do with it, “how do you even play a pick up game with no point?”. They eventually released the Generals Handbook. That fixed the game enough to make it playable, but I was still not interested. It was not until the release of the Nighthaunts that I had seen anything that I liked from the new models, “flying dwarves are stupid. fight me”. Then the endless spells models came out, it was at this point I said if anything is going to make me play this game it is going to be these models. For some reason I just like the endless spell models. I have always like the idea of spells represented on the table by models. With all the new models and AOS second edition coming out and making the game playable I was starting to warm to the idea of dusting my old Vampire Counts off and checking the game out. It was not until a few weeks ago that Vince decided to run an AOS tournament at Montags. At first I was not vaguely interested, then for some unexplained reason, a reason I am still trying to work out in my head, I decided I may want to play. But just because I may want to play in the tournament does not mean I will. For one thing all my models are square based and I 100% refuse to re-base 150+ models. So I asked if square bases are allowed and to my surprise no one seemed to have a problem with it. Even going as far as to bring up official rules that showed they are allowed. So for the last week or so I have been trying to figure out how the game works, how do I build a list, how do I play the game. As I have read several article and watched a few how-to play videos. I am confident I can learn the basic mechanics by the time of the tournament. I think I have a few good ideas for a list using the models I have. The big question is will I be able to understand target priority and have the forethought to make moves while keeping in mind the mixed turn sequence. Only time will tell. But as it stands I am planning on playing some AOS, something that I thought that I would never do. I think that time can heal all wounds. I’m not sure that I will like Sigmar, but I at this point I will give it an honest try. Thank you for taking the time to read through my ramblings. What is your AOS story? Do you like the game or do you long for the days of 8th?